I read this article and found it very interesting, thought it might be something for you. The article is called The History of Healthcare Interoperability and is located at https://hitconsultant.net/2013/04/11/history-of-healthcare-interoperability/. In 2004 President Bush created the Office of the National Coordinator for Health Information Technology (ONC), introducing the notion that Health Information Technology (HIT) should be nationally coordinated. One of the first endeavors of ONC was the planning and design of a National Health Information Network (NHIN) as a means to facilitate the exchange of electronic health information among providers and Health Information Exchange (HIE) entities. 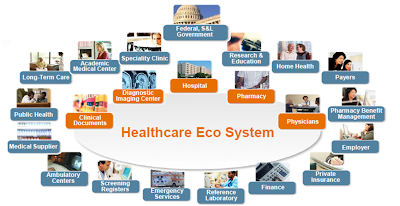 This was, and still is, a grand vision of an interconnected health care ecosystem, inclusive of all governmental agencies and all stakeholders who in any shape or form make a living or a profit from servicing the health care needs of the nation (see image below). To prime the pump for enough electronic information to be exchanged, the newONC made grants to the American National Standards Institute (ANSI) for the creation of a Health Information Technology Standards Panel (HITSP) to assemble standards for the exchange, and to RTI to create the Health Information Security and Privacy Collaborative (HISPC) to work with business stakeholders at a State level. Both these committees are defunct now, but HITSP had a very productive and highly visible lifespan, attracting sponsorship from government contractors and trade associations. In addition, ONC also awarded a grant to a new entity, theCertification Commission for Health Information Technology (CCHIT), which was pulled together by the American Health Information Management Association(AHIMA), the Healthcare Information and Management Systems Society (HIMSS) and the National Alliance for Health Information Technology (NAHIT). Both AHIMA and HIMSS are flourishing these days, but NAHIT voluntarily dissolved itself (and removed its website). The funding for CCHIT was aimed at creating a certification program for Electronic Medical Records (EMR), including interoperability capabilities. In 2006, CCHIT began certifying EMR software and was the sole government designated Recognized Certification Body (RCB). In 2009 President Obama injected much needed stimulus dollars and empowering legislation into the ONC. The HITECH Act opened a new era of prosperity for all things HIT. The prolific HITSP and the less stellar HISPC were replaced by two brand new Federal Advisory Committees, an HIT Policy Committee and an HIT Standards Committee to make recommendation to the reinvigorated ONC in its efforts to implement the Meaningful Use incentives program. CCHIT lost its unique certifier position and became just one of several government sanctioned certifiers of Meaningful Use compliant Electronic Health Records (EHR). The NHIN, now part of the Federal Health Architecture (FHA), acquired a new open source gateway called CONNECT first deployed in 2009 to connect the Social Security Administration (SSA) and MedVirginia for the processing of electronic disability claims. But the NHIN, with its stringent requirements for blessings from the Federal Bridge Certification Authority (FBCA) and a rather uninviting CONNECT gateway, was judged to be a bit too heavy and slow to provide instant gratification. So in 2010, NHIN was given a new smaller and nimbler sibling, aptly named NHIN Direct, intended to facilitate health information exchange through something as simple and as ubiquitous as email attachments (encrypted, of course). For one reason or another, NHIN changed its name to the much hipper NwHIN (Nationwide Health Information Exchange) and NHIN Direct dropped its NHIN name affiliation to stand on its own as the Direct Project. The ONC then initiated a major push to have its various grantees (e.g. State HIE, Regional Extension Centers, and Beacon Communities) exchange health information through the Direct Project flavor of secure email. Most HIT vendors complied and implemented the Direct Project specifications in their products. In 2011, the ONC created the Standards and Interoperability (S&I) Framework, “a collaborative community of participants from the public and private sectors who are focused on providing the tools, services and guidance to facilitate the functional exchange of health information”. Started with three initiatives, the S&I Framework now includes dozens of projects and workgroups, managed by government contractors presumably on a volunteer basis, and the Direct Project has been folded into this new framework, and shortened its name to Direct. In the meantime outside the confines of ONC, interoperability players can trace their pedigree to 1997 when HIMSS and the Radiological Society of North America(RSNA) created an organization named Integrating the Healthcare Enterprise (IHE) to develop frameworks and specifications (profiles) for health information exchange. IHE has been very active and very prolific over the years. In 2011, theEHR/HIE Interoperability Workgroup (IWG), a consortium of States and HIT vendors, with a goal of “increasing the adoption of EHRs and HIE services”, was created by the New York eHealth Collaborative (NYeC), an organization with extensive ties to ONC, founded in 2006 to facilitate HIT adoption and health information exchange in the State of New York. Leveraging IHE work, the workgroup created guidelines and specifications “to promote a scalable approach that allows for rapid deployment at an affordable price, thereby expanding market opportunities for vendors”. Around the same time, Mayo Clinic, Geisinger, Kaiser Permanente, Intermountain Healthcare and Group Health formed the Care Connectivity Consortium (CCC) to “demonstrate that effective and timely health information exchange using the latest national IT standards is possible in a secure environment and among geographically disparate health care providers”. Things were beginning to heat up. In May 2012, the ONC requested public comments on its strategy for governing health information exchange through its NwHIN. The ONC envisioned a set of Network Validated Entities (NVEs), similar to the Direct email intermediaries, Health Internet Service Providers (HISPs), specifically built for, or specializing in, the exchange of health information, and it outlined policies and regulations to be adhered to by participants in information exchange as “conditions for trusted exchange” (CTE). By October 2012, the ONC decided to transition the NwHIN community management to a new public-private entity named Healtheway and rename it eHealth Exchange. Almost immediately, Healtheway formed a Coalitionwith the NyeC spawned IWG to combine harmonization of standards and market share. The next step was an announcement that the Coalition selected CCHIT to “certify that the interfaces between the HIT and HIEs are consistent across multiple states and systems”. 2012 also saw the creation of DirectTrust, an entity whose goal is to “to develop, promote and, as necessary, help enforce the rules and best practices necessary to maintain security and trust within the Direct community, and to foster widespread public confidence in the Directed exchange of health information”. In December, ONC announced its intention to provide grant funding to “entities already involved in governance of health information exchange” and forgo its own regulatory plans. During the 2013 HIMSS season, the Coalition announced a collaboration agreement with the CCC to take advantage of the CCC “advanced services that address the complexities of patient matching, consent management and, eventually, population care”, and CCHIT announced three new certifications, one for EHRs connecting to HIEs, one for HIE to HIE connectivity and one for Direct users. Across town, DirectTrust, in partnership with the Electronic Healthcare Network Accreditation Commission (EHNAC), announced its Direct Trusted Agent Accreditation Program, DTAAP, for HISPs, Certificate Authorities, and Registration Authorities, which may or may not be EHR or HIE vendors. Also at the HIMSS extravaganza, a new Alliance, consisting of several very large EHR vendors, named CommonWellentered the interoperability fray, announcing its plans “to promote and certify a national infrastructure with common standards and policies” and to “ensure that products that display the CommonWell Health Alliance seal have been certified to work on the national infrastructure”. It is important to note that, all the organizations described here (except the government, of course) are not for profit corporations and most are supported by government grants to certain degrees. They all charge, or plan on charging, some sort of membership and/or subscription fee, and by my last count at least three of them plan on offering, and charging for, certifications of software products used to exchange health information in any way. Also interesting is the fact that HIT vendors are participating in multiple organizations, so for example an EHR vendor can be part of both the Coalition and the Alliance, or part of none. Fortunately though, most leaders of these new entities, are currently, or were in the past and presumably will also be in the future, involved in the various ONC regulatory and technology specification activities. The factions described here are by no means the only actors in the health information exchange game. Such revered standards organizations as HL7, NCPDPand ASC X12, who have been supporting practically all health care interoperability efforts on their own for many years, or the various international open standards groups, or the hot new BlueButton initiative, are not really contenders for what’s at stake here, but should be acknowledged for completeness sake. So last week, ONC picked its favorites and granted less than half a million dollars, split between DirectTrust and the IWG, and their partners, to bolster their existing attempts at governing the national exchange of health information. Congratulations to both. Margalit blogs regularly about healthcare technology on her site: On Health Care Technology where this article was first posted.